Use a guide for choosing the ideal wedding cake stands to help you make this important decision. The right cake stand ensures your wedding cake creation is showcased the best possible way. Traditionally, wedding cakes have three-tiers, with the bottom tier of the cake being the largest and the top tier of the cake being the smallest of the three cakes. The round or square tiers of the cake simply stack one on top of each other. In contemporary times, however, brides are opting to display their wedding cake, three tiers or not, using a display accessory, which can range from a cake plate, plateau stand or pedestal cake stand. Primarily, the option a bride and groom chooses to use comes down to preference. The ornateness or simplicity of the cake, the number of tiers and the placement of the cake can also help to determine which option is right. The cake plate is a flat option. The entire cake is placed on the flat plate, which serves as a form of decoration. For brides and grooms that have a large cake or a cake with numerous tiers that does not need any elevation, a cake plate can be a simple and easy way to display the cake with a little pizzazz. Cake plates are also an option for small and intimate weddings, where the cake is small, such as one or two tiers, and the couple wants to keep the display simple. Raynaud Salamanque Platinum Flat Cake Plate: This cake plate pays homage to Salamaque, Spain and its Art Noveau architecture. The design on the flat cake plate is in platinum. Lenox Serveware, Eternal Leaf Cake Plate & Server: Perfect for a small, garden wedding, the 10.5-inch, eternal leaf cake plate is shaped like a delicate leaf and trimmed with gold. Abigails Madison Manhattan Flat Cake Plate with Dome: This clear glass cake plate comes with its own dome for storing cake after displaying it. The cake plate measures 14 inches across. The plateau stand is raised uniformly off the table. A plateau stand tends to come into play when a couple wants to elevate the cake off the table. Plateau stands do not tend to stand as tall as a pedestal cake stand. Cakes that have three or more tiers--tall cakes--work best on a plateau stand because the stand is an ornament for the cake without elevating it too far off the table. Additionally, plateaus tend to be wider than cake plates and pedestal cake stands so plateaus can accommodate cakes that are wide. The plateau helps to bring the cake to the forefront when it is displayed on a cake table with other decor, such as flowers, flower petals, tulle or chiffon table dressing. Silver Plated Rose Wedding Cake Plateau: Four ornate feet on the stand raise the 16-inch cake plateau uniformly off the table. Roses adorn this silver-plated cake stand. Gold Finished Cake Plateau: The gold beveled cake plateau has a smooth and shiny finish. The plateau measures 17-inches by 24-inches. Mirror Display Cake Tray: This square cake plateau measures 11.5 inches across. The mirrored edge is an added touch to accent the display. The pedestal is raised in the center by some sort of pillar. 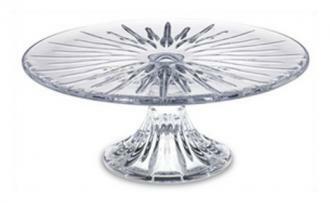 The pedestal cake stand is probably one of the most popular cake stand options and most widely used. The pedestal cake stand raises the cake at the highest level when comparing it to a cake plate or cake plateau. This type of cake stand can be used for dosplaying any type of cake with one or more tiers. Rococo Noir Black Cake Stand: This cake stand is made of stoneware painted shiny black. It measures eight and one-quarter-inches in diameter. Aztec Flower Pedestal Cake Stand: Standing three-inches tall and measuring ten-and-a-half-inches in diameter, this cake stand pays homage to the Aztecs and their designs. Tag Hobnail Rim Pressed Glass Pedestal Cake Stand: Made of depression glass, this cake stand comes with a hobnail design around the rim of the plate. The pedestal stands four and one-quarter-inches tall and measures ten and three-quarters inches in diameter. When a couple wants the tiers of their cake on individual display, a grouped cake stand arrangement is typically the best option. This allows each cake to be displayed individually on its own stand. The stands are usually staggered at various heights for effect. Stands can be arranged to form a staircase look, so that the shortest stand is first and each stand increases in height to make it look like a flight of stairs. You can buy individual cake stands of the same design, but differing heights--from shortest to tallest. Place the stands in ascending order one if front of the other to give it the appearance of a set of stairs. Stands are arranged symmetrically with the tallest in back and the shorter stands in front. Buy three stands of varying heights. Use the same cake plate that comes in different heights or choose three different designs of varying heights. This is best when cake tiers are different in shape and size. Each tier of the cake can occupy its own cake stand and be arranged so that the cakes complement one another or can be placed on individual tables. Buy individual cake stands, one for each cake tier. Arrange the cake plates as you wish, creating a circle, square, lines or a scattered look. Separate stands arranged in these types of groupings create a wonderful effect and work well with intricate and individually decorated cakes. Cakes that have non-traditional shapes (are not round or square) also work well in this format because they can be displayed individually. Keep in mind if you choose a cake stand of this nature you will need a cake table with ample room to display the cakes. You can buy individual cake stands, either of the same design or different designs, and arrange them accordingly. Donna Hay for Royal Doulton Cake Stands: These cake stands come in three different sizes, so you can buy one of each size or all the same size, depending on the look you seek. In classic white, the stand is made from bone china and comes in small, medium or large. Reed & Barton Crystal Soho Pedestal Cake Stand: This cake stand provides a contemporary look with its radiating cuts in the crystal. Standing five inches tall, the plate portion measures 12" from side to side. Burlap Lace Wood-Square: This square cake stand is ideal for a square wedding cake. The wood grains can vary from stand to stand. Each stand stands 4" tall and measures 16" wide. Another option for displaying wedding cakes involves using cake stands with pillars. A cake stand in this category uses some type of pillars and bases in between each tier of the cake. The pillars can vary in size, with taller pillars providing more height. The cake stand with pillars creates more height than the traditional stacked wedding cake. To create this look, purchase sets that come with the base stand and pillars. The first layer of the cake either rests on a base stand without any height or pillars holding the base up. Another option is to have the bottom tier of the cake resting on pillars. For cakes with pillars holding up the first layer of the cake, candles, fountains, theme décor or a centerpiece can be displayed under the cake. Instead of pillars, other separators, like glass globes or wire spirals can also be used to complement your wedding theme. Roman Pillar Tier Set: This set comes in white. It includes a set of six Roman-style pillars and a cake plate on the top and bottom of the pillars. The pillars stand 13 ¾" high and the plate is 18" round. 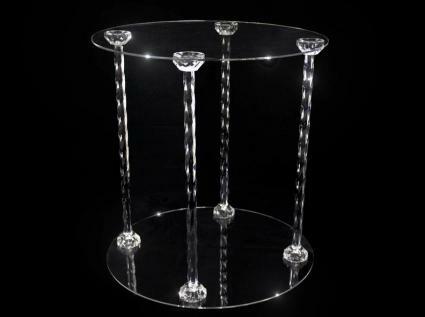 Acrylic 4-Pillar Cake Stand: Four pillars in a roman-style design made of acrylic holds a 15" cake plate. The stand height is 15.5". Scalloped Cake Stand: This cake stand is made of ceramic. The scalloped edge gives the cake separator plate a finished look. The stand comes in 9" and 11" options. Another type of cake stand is the floating stand. This holds the bases above one another by a central stabilizer that lies behind the cake, giving an appearance that the tiers of the cake are 'floating' on their individual bases. This type of cake stand is generally used with a three-tiered cake as a variation from the three-tiered traditionally stacked wedding cake. Round floating tiers cake stand: This white metal floating cake stand includes three floating cake plates of 8", 12" and 16". The stand collapses and folds for easy storage. 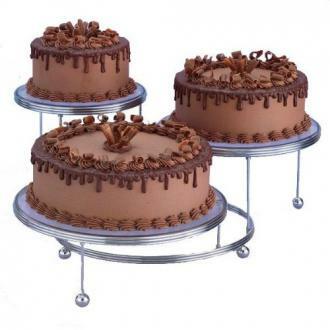 Cakes and more 3-tier party stand: This plastic 3-teier floating cake stand looks like metal but is really plastic. To its highest point, the cake stand measures 13" high and 13" wide. Rather than a stacked floating look, this cake stand has tiers that flank the side of the base cake plate. Graceful tiers cake stand: This cream colored metal stand measures 29 ½" by 12 1/2" and holds three different cake plates-8", 10" and 12", which means the cakes can measure 6", 8" and 10" round. Rotating cake stand allows wedding cake designers to rotate the cake as they decorate it. 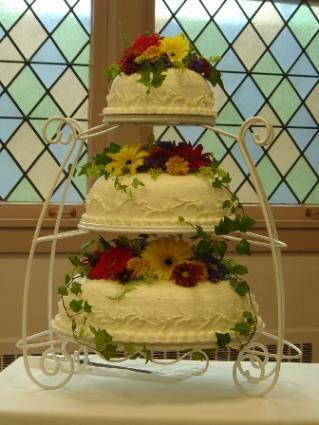 Revolving cake stands also make it easier to put a wedding cake on display and adjust it to fit any angle. These cake stands are manually turned. Electric revolving stand: Place a cake directly on this electric rotating stand or use it as a base for a stacked wedding cake. Plug the stand in and the wedding cake rotates automatically. 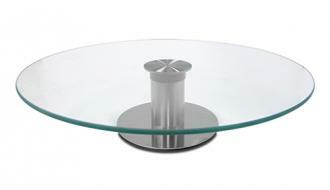 Glass revolving cake stand: This contemporary cake stand features a glass plate and metal base. The plate holds up to 12" cakes and rotates 360 degrees manually. Like most of your wedding décor choices, there is no real right or wrong when it comes to choosing your cake stand. It can be as simple or as ornate as you wish. If you have an heirloom cake plate or stand you may wish to use that. Alternately, you may be able to use another display, for example, the cake arranged on upside-down terra-cotta pots for a spring or garden themed wedding. If you'd like a non-traditional option of this nature be sure to discuss it with the bakery first to be sure it is acceptable for holding and displaying your cake. Some bakeries may include wedding cake stands of single use-Styrofoam or cake stand rental at no additional cost. When you order your cake it is a good idea to clarify this as you may have to pay an additional cake stand rental cost, or supply your own if you'd like a different selection. Victorian garden: The Victorian era brought its own style to everything, including cake stands. Victorian cake stands are ideal for Victorian garden weddings, Victorian theme weddings, or just want a couple wants a slightly more ornate cake stand. Iron: Iron cake stands can feature special designs, scrolls and cuts to meet the needs of any style wedding. Some iron cake stands are handmade so couples can opt for a customized look for their cake stand. Glass: Clear glass and color cake stands is another options for displaying wedding cakes. Some stands have glass plates with base pedestals of different shapes and materials, while others have glass pedestals as well. Metal: Silver, nickel and gold plated cake stands are also an option for displaying cakes. Couples can choose a metal finish that complements their wedding décor. Hand-painted: add a special touch or sentiment to wedding cake display with a hand-painted cake stand. The stand can be painted to match wedding colors or include the bride and groom's names along with the wedding date. Unique shapes: For the bride and groom looking for something unique and innovative, special shaped cake stands include a Cinderella carriage, yellow daffodil and a heart-shaped cake stand. With so many options, it can seem like a daunting experience to choose the right cake stand. It doesn't have to be, however, by following a few guidelines. Number of tiers: The number of tiers you choose for your wedding cake is a preference. Cake designers work with couples to bake and create a cake that fits their design preference and also feeds the number of wedding guests expected at the wedding. Stand size: The bottom plate of the cake stand should ideally be the same size as the cake board that holds the bottom tier of the cake. If it is not the same size then the cake plate should be slightly bigger than the bottom tier of the cake. Cost: The number of tiers and the material the cake stand is made of determines the cost of the stand. Cake stands can run the gamut in pricing, so just as a bride and groom budgets for the other areas of the wedding, budgeting the cost of a cake stand is also essential. It is possible to find cake stands that start as low as $25. It is just as easy to find cake stands, even flat cake plates, that cost more than $600. Color/Material: brides can choose a color and material of a cake stand to match the color scheme and theme of the wedding. Additionally, heavier cakes (cakes with more tiers) can require cake stands that are more durable (i.e., a five-tier cake can require a metal cake stand, while a one-tier cake can have a plastic, glass or metal stand). Usability: Couples can also consider the ability to use the cake stand again in the future. Social entertaining, parties and holidays are great occasions to bring out the cake stand to display cupcakes, pastries, appetizers, finger foods and more. In a situation where a cake stand can be multi-purposed, spending a bit more on the front end is possible. The wedding cake is often a focal point of the wedding reception. Choosing the right cake stand to display the cake adds a special touch to any type of wedding. With so many options to choose from, learning about the various options available makes it possible to find the cake stand that best complements the wedding cake, the budget and the look and feel of the wedding.